On February 26, 1917, five young musicians stepped onto the 12th floor of 46 West 38th Street in New York City to record in the illustrious Victor Talking Machine Company's brand new recording studios. The maverick group comprised of Dominic James "Nick" LaRocca (1889–1961) on cornet, Edwin Bradford "Eddie" Edwards on trombone, Lawrence James "Larry" Shields (1893–1953) on clarinet, Henry Walter Ragas on piano, and Antonio Peter "Tony" Sbarbaro (sometimes Spargo) on drums, who all originally hailed from New Orleans. To set themselves apart from their predecessors, they had started to call themselves a name which reflected both their unusual style and their Southern heritage: The Original Dixieland Jass Band, or the ODJB for short. With all five under the age of 30 and lacking any traditional musical knowledge, their presence in the highbrow New York City studio was nothing short of baffling. However, by the end of their day at 46 West 38th Street, they unknowingly changed the course of history. Victor Record 18255 featured "Livery Stable Blues" and "Dixie Jass Band One-Step," which would give most of the world its first taste of jazz, and change the world of music forever. One hundred years later, The Original Cornell Syncopators will celebrate the anniversary of the first jazz record by performing the 1917 repertoire of the Original Dixieland Jass Band. Narrated by Ithaca jazz veteran Joe Salzano, the performance includes a recreation of the historic original recording session, as well as what it would have been like to see the band live at New York City's famed Reisenweber's Cafe, complete with period dance performances by the Crazeology dance troupe. The Original Cornell SyncopatorsJoe Salzano, coachColin Hancock (B.S. URS '19), cornetHannah Krall '18, clarinetNoah Li '19, drumsAmit Mizrahi '19, pianoRishi Verma '19, tromboneWith guests Crazeology, Troy Anderson '19, and Paul Merrill Act I: A Night at Reisenwebers "Tiger Rag," (1917) Original Dixieland Jass Band"Ostrich Walk," (1917) Nick LaRocca, Larry Shields"Look at 'Em Doing It," (1917) Larry Shields"Soudan (Oriental Jazz/In the Soudan)," (1908) Gabriel Sebek (1853–1921)"At the Jass Band Ball," (1917) Nick LaRocca, Larry ShieldsAct II: The Recordings "Darktown Strutter's Ball," (1917) Shelton Brooks (1886–1975)"Indiana," (1917), Ballard MacDonald (1882–1935), James F. Hanley (1892–1942)"Livery Stable Blues," Ray Lopez (1889–1979), Alcide 'Yellow' Nunez (1894–1934)"Dixie Jass Band One-Step (Intro: That Teasin' Rag)," ODJB and Joe Jordan (1882–1971)About The Original Cornell SyncopatorsThe Original Cornell Syncopators were founded in 2016 at Cornell University by cornetist Colin Hancock with the goal of creating an ensemble dedicated to the preservation and performance of early jazz music. Rather than simply performing music from transcriptions, the group's mission is to interact with and perform the music in the same way that bands did during the Jazz Age, and by learning the vocabulary of the music in the same way that many young jazzers do with more modern iterations of the music. Paul Merrill, the Gussman Director of Jazz Ensembles, helped Hancock search for interested students among the music community and distinguish the combo as a legitimate part of the jazz program. 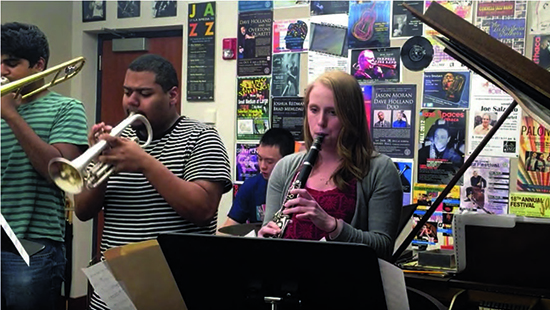 On trombone, sophomore Rishi Verma (from Ithaca, majoring in operations research and information engineering) came in from the Jazz Band; and on clarinet and saxophones, junior Hannah Krall (from West Lawn, Pennsylvania, majoring in music) came from the Wind Symphony and the Jazz Combos. The rhythm section includes sophomore pianist Amit Mizrahi (from West Bloomfield, Michigan, majoring in computer science), who also came from the Jazz Combos; and sophomore drummer Noah Li (from Westchester, New York, majoring in information science). Hancock is a sophomore from Buda, Texas, majoring in urban and regional studies. Finally, local upstate jazz icon Joe Salzano was chosen as the combo's coach, while three guest jazz veterans — Dan Levinson, David Sager, and Hal Smith — also served as coaches at large, helping guide the group through exchanges in recordings and emails. Their assistance helped turn the Syncopators into a fiery and tightly knit ensemble, now known well outside of Cornell. After this Barnes Hall presentation, the band plans to augment to nine players and begin exploring the jazz of the mid-20s and beyond, including pieces by Bennie Moten, the New Orleans Rhythm Kings, Louis Armstrong, and Bix Beiderbecke.